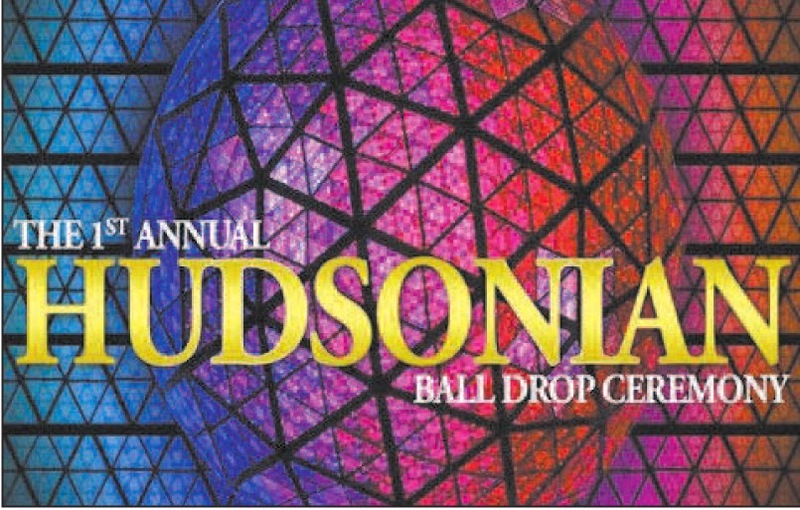 While the Waterford New Year's Eve Ball is being readied for its midnight descent in Times Square, Hudson's first ever ball drop remains a fairly well kept secret. There was a little piece about it over the weekend in the entertainment guide On the Scene, and there's an article about it in today's Register-Star. The festivities begin at 8 p.m. at A.M.E. Zion Church, with a message for the new year from Mayor William Hallenbeck. The party then moves outdoors, to the lower end of Warren Street, where there will be music and entertainment until 11:45 p.m., when the countdown to the ball drop begins. Register-Star reporter Katie Kocijanski describes the event as "an alternative to the hustle and bustle of the city." It's for sure that a million people won't be showing up in Hudson to witness the ball drop, but there's another difference as well. There won't be an actual ball. 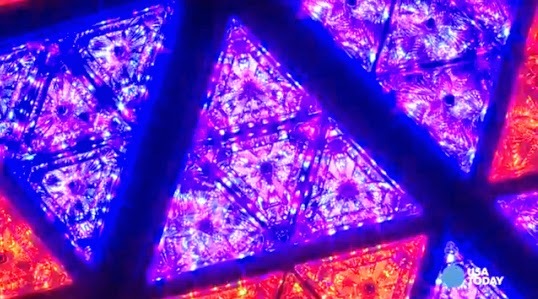 According to reports, the ball that will descend in Hudson at the stroke of midnight will be a 3D computer graphic, and it's promised it will be visible from as far away as the top of Warren Street. 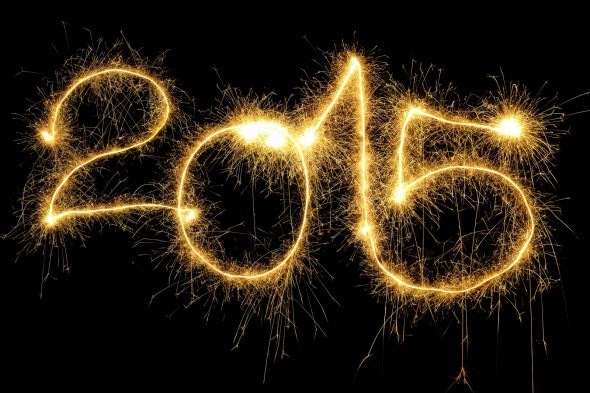 Wondering what the new year will bring? Tune in this morning at 10 a.m. to @Issue on WGXC. 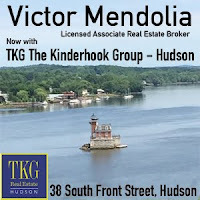 Victor Mendolia and Debby Mayer will be sharing "serious, funny, hopeful, and outrageous" predictions for 2015 made by people you know in Hudson and Columbia County and inviting listeners to call in with their predictions. Listen at 90.7 FM or online. 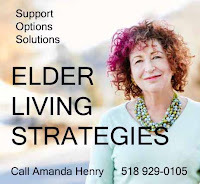 To share your prediction, be it "prescient, funny, clever, or snarky," call 518 828-0290 between 10 and 11 this morning. At its last meeting, the Common Council Legal Committee took up the issue of the weighted vote, which, at the present time, gives the aldermen from the Fifth Ward votes that are twice as powerful as those cast by the aldermen from the Second and Third wards and nearly three times more powerful than the votes cast by the aldermen from the First and Fourth wards. Weighted voting has been used since 1974 in Hudson to achieve the constitutional principle of "one person, one vote." The weight of the vote cast by every alderman is calculated based on the number of residents in the ward she or he represents. Every ten years, after the decennial census, the weighted vote is recalculated. As the table below shows, after the weighted vote scheme was implemented in 1975, nothing changed for the next three decades, presumably because there were no significant changes in the population of the five wards. Changes to the weighted vote began in 2005. After the 2000 census, the First and Fourth wards each lost a significant number of votes; the Second Ward gained a little; the Third Ward gained quite a bit; and the Fifth Ward lost a little. In 2014, after the 2010 census, there were more dramatic changes. The Third Ward lost a third of its voting power, and the Fifth Ward's voting power increased by more than 30 percent. 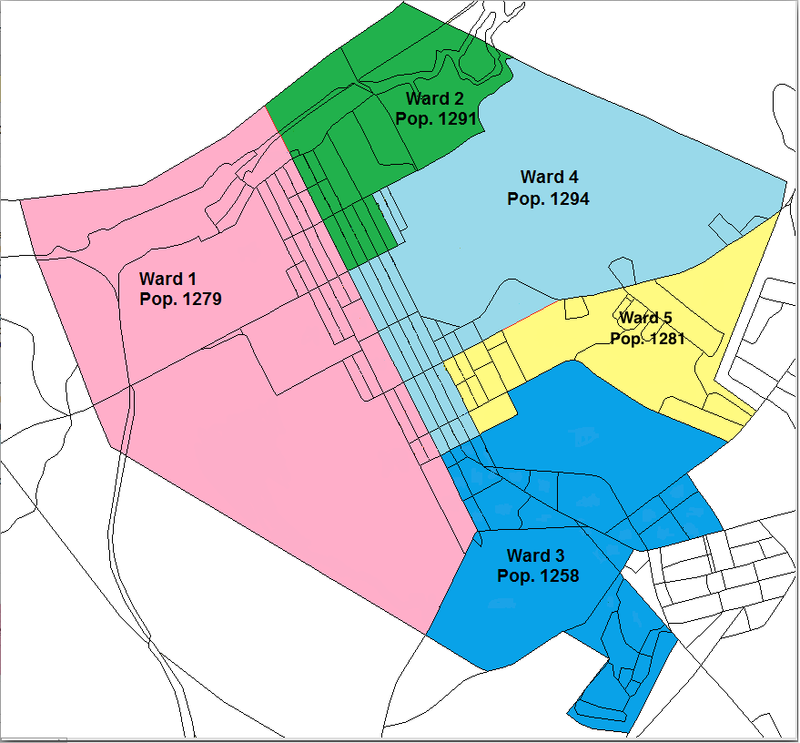 The Third Ward aldermen lost voting power because the ward lost population. 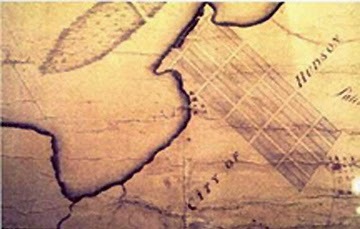 In large part, the population loss was owing to the new law in New York State mandating that prisoners be counted, for legislative districting purposes, in the communities where they had lived prior to incarceration rather than in the communities where they resided as prisoners. The Fifth Ward aldermen gained voting power because the Fifth Ward was the only ward in Hudson whose population had grown. 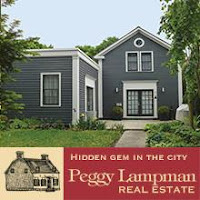 It was recently discovered, however, that a major part of the alleged population growth in the Fifth Ward was a mistake. The residents of the seventy units at Crosswinds, a development that didn't exist before 2008, voted in the Fourth Ward but were counted in the Fifth Ward for the purposes of determining the weighted vote. They strengthened the voting power of aldermen for whom they did not--could not--vote. In the late winter and early spring, law students from Hofstra University, working with their professor, Ashira Ostrow, and Eric Lane, dean of the law school, studied aspects of Hudson's government. 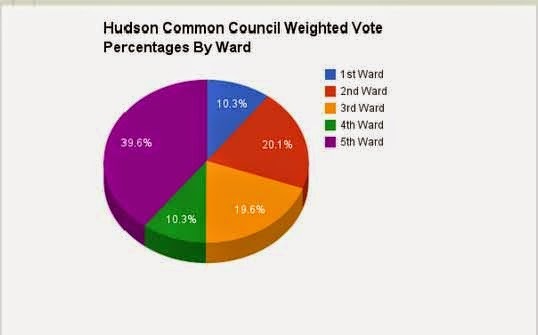 One of the topics was Hudson's weighted vote system. Two of the students, Brendan Friedman and Peter Barbieri, examined the weighted vote system to determine if it achieved the constitutionally required "one person, one vote" standard. Among the points made in the Executive Summary of their report was this: "The most common, and preferred, method of complying with one person, one vote is to draw districts with equal populations." 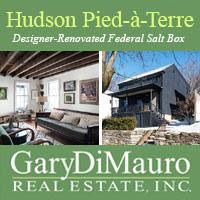 So what might the map of Hudson look like divided into districts with equal populations? Hudson resident Steve Dunn, a lawyer who has turned his legal mind and mathematical acumen to the issue of the weighted vote, created this map which shows a possible way to divide the city into five election districts that are very nearly perfectly equal in population. The petition to keep the replica Half Moon in New York and on the Hudson River, initiated a week ago by Albany mayor Kathy Sheehan, now has 383 signatures, but certainly more are needed. 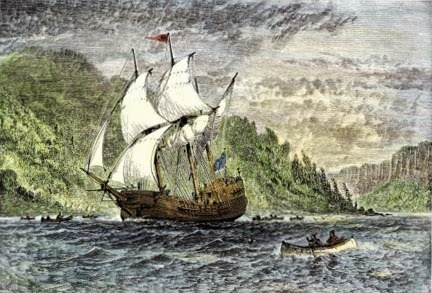 If you haven't already done so, click here to join those calling for the replica Half Moon to stay where the original ship made its most significant journey. As some readers know, Gossips (not the blog but the person who writes it) was born and raised in Holland, Michigan. By curious happenstance, the Holland Sentinel reported on Sunday that one of the most popular names given to baby boys born in Holland Hospital during 2014--along Alexander, Lucas, Elijah, Blake, Isaac, Jacob, Michael, Noah, and Adrian--was Hudson! Yes, it's a logical fallacy, but still . . . after two posts on Gossips about disappearances and departures, the Register-Star offers an explanation of what's afoot: "Columbia-Greene Media announces news gathering operation restructuring." 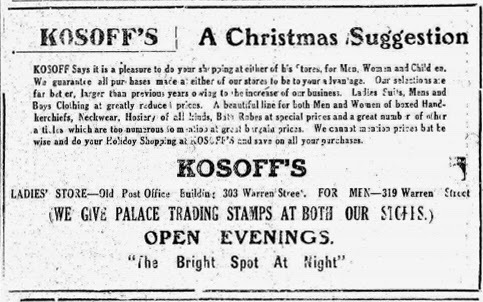 Here is the conclusion of our mystery shopper's three-day holiday shopping escapade in Hudson in 1914. 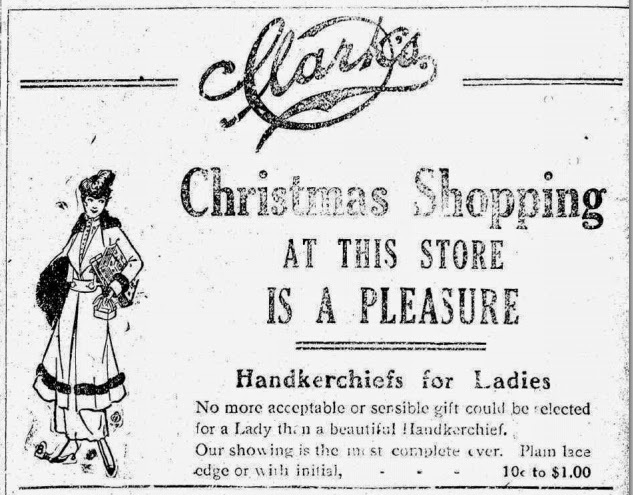 In the final day, which she confesses was "but a few days before Christmas," she gets around to buying something more than just a box of cigars for her husband. My third and last day of Christmas shopping in Hudson has been completed. It now seems that I can enjoy the real spirit of Christmas as I confess I was quite nervous since the first of the month trying to think of suitable gifts for all. I can thank the pretty shop girls for their help as the advice I received from them seemed to be just what was needed. As my last day "doing the rounds" was but a few days before Christmas, I arose early and after a hearty breakfast made a start for the stores shortly before 9 o'clock, I decided then that I would have every gift purchased before I returned to my comfortable fire-side but I was compelled to alter my decision later. My first stop that eventful day was at the store of William L. Speed on Columbia street. I wanted to have my kitchen range in the best shape possible on Christmas when my turkey, cranberries, etc., depended upon it. 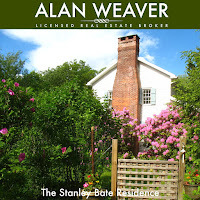 A neighbor was looking over the great line of stoves and I guessed his household and wife were to be made happy. I then decided to look over some things for my husband. 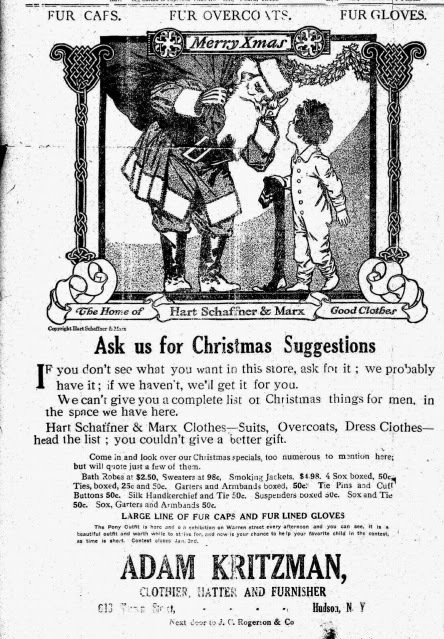 His wardrobe was a bit in need and therefore I decided to purchase his needs at this time, for useful and necessary presents always please the men. 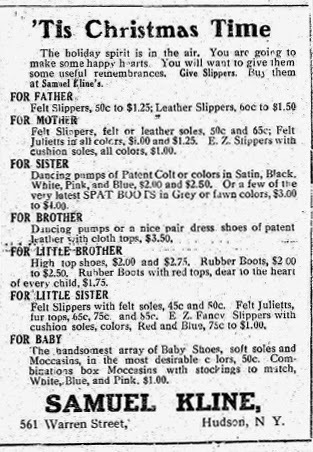 At the Pan-American Clothing House I found everything a man would want from shoes to neckwear and I purchased many articles. Then I stopped at Adam Kritzman's, the home of Hart, Shaffner & Marx clothes. A new suit could not help but make the best present possible to give a husband and there I found just what I needed. Every essential in man's attire can be found at that store. 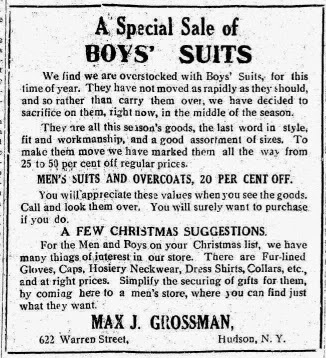 At Max Grossman's store on the opposite side of Warren Street I found another place where the needs of a man could be found. After completing my shopping in this store I visited the shoe store of Samuel Kline. 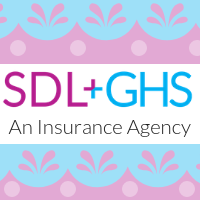 My purpose was to find a pair of rubber boots for my little son but before I left I had placed some of my shopping money on my side of the ledger, having purchased a pair of shoes for myself, just the kind I wanted. As I traveled down the street further I noticed a crowd of children and soon saw a real live Santa Claus parading thru the streets with his red coat and long whiskers. He stopped in front of the store of David Kline, a first class shoe house. I remembered then that I had forgotten to purchase a pair of slippers for my little daughter so I visited the second shoe store within an hour and found a most pleasing bargain. 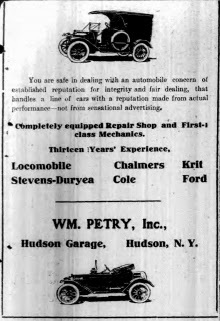 Upon leaving the store I met an old acquaintance of mine who was shopping with the aid of her auto, a new "Hudson Six" which was purchased of the Crescent Garage Co. She invited me to accompany her and I did so. 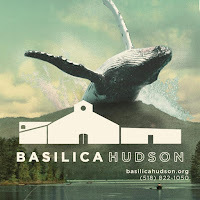 We made a brief stop at the Hudson River Trust Co., where she cashed a check. She was considerably delayed there on account of the great business which this bank enjoys. The conversation lead to Christmas dinners and the time it generally took to cook everything. She told me she had recently purchased a new range from F. A. Macy which had proven the fastest and best "cooker" she had ever had. Fortunately she was making her last search for gifts for the male members of her family, too, so we were able to make the same stops at the same time. At Samuel Lewis' clothing house we found everything that is made [to] adorn a man from a suit of clothes to an overcoat. They carry extensive stock in this store from which a careful shopper can find hundreds of bargains. 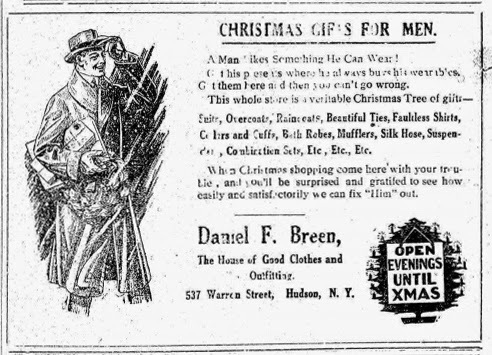 Next we visited Daniel Breen's store in our search. The latest models of everything a man wears is on display in this spacious store. 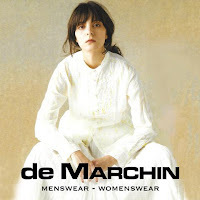 In both these places we purchased but there are so many stores where men's apparel is carried that we decided to look them all over and we were well repaid. William Fruchting's style shop received a call and my friend found an exceptional bath-robe here of the latest design. The neck-tie and hand-bag display here attracted my attention. Then we were driven to the haberdashery shop of A. R. Vosburgh. There was another place where everything a man wants can be found. A suit of clothes which had been ordered by my friend for her husband's major present was awaiting her arrival and she and I were highly pleased with the workmanship. We had two more haberdashery shops to look over yet so we continued to the C. R. Harder & Co. 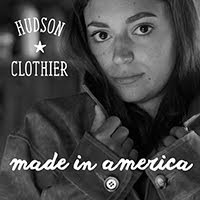 Here is Hudson's $2 hat store and it struck me then that if a woman is so pleased when her husband brings home a hat why should not the plan work the other way. I therefore purchased a neat winter hat for my husband while my friend looked over sweaters. 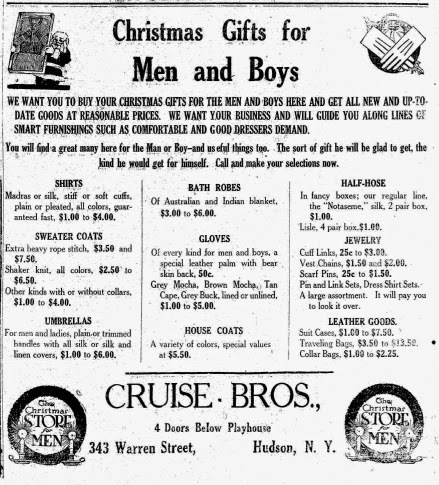 Cruise Brothers, one of the oldest haberdashery establishments in the city, received our last visit in looking out for the men. They had an excellent line of sweater coats, half hose, bath-robes, leather goods, etc. We purchased everything that we needed in this line and then started to conquer new fields. With the aid of the automobile we had saved much time and therefore I had visited far more stores that I had anticipated. The chauffeur had to make a trip to the Knott Vulcanizing shop on Green street for some tire repairs, so we decided to walk about a bit and look over the store window display. The first thing we noticed was an assortment of ladies' shirt waists at a store which we had forgotten. I then recalled the advertisements of Kosoff's in my Morning Republican. We entered the store and found a beautiful line of silk apparel for ladies as well as hundreds of articles which a woman wishes. We made a number of purchases here. We walked about the streets and then noticed the suits for both men and women on display in the show windows of Paris & New York Tailors. 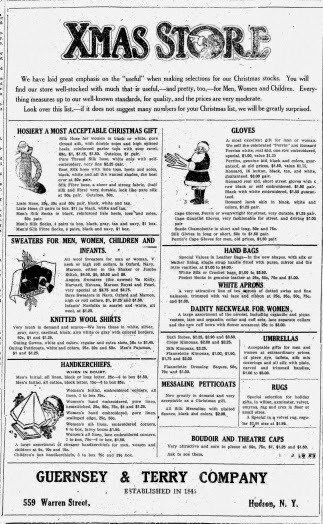 Perhaps many of these were presents for wives who would have a right to be real merry on Christmas. The chauffeur returned by that time with the car and my friend immediately sent him to the tailoring shop of M. D. Maloney to get the dress suit which her husband had ordered there for the Charity Ball on Christmas night at the armory. 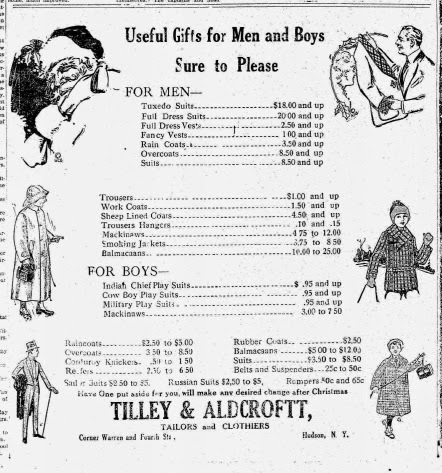 The clothing question caused me to think of a little overcoat for my little son so we went across the street to the well known store of Tilley & Aldcroft where I found no difficulty in finding just what I wanted. My friend profited by the large assortment of clothing of every kind carried here and she also made a purchase. It was there lunch time and my friend ordered the chauffeur to drive me to my home after I had been compelled to refuse her kind invitation to dine with her. 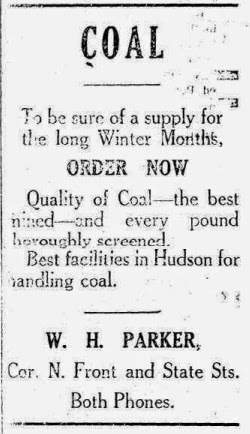 On the way home our trip was interrupted by the coal wagons of Van Wyck-Thorpe Co., W. H. Parker and B. S. Johnson. My friend informed me that they were delivering coal to some poor families, several big-hearted Hudson men having taken this method in making the needy happy. It surely was the kind of gift that meant "Merry Christmas" to all. Another tram also got in our way but this held a precious gift for a young girl, a piano which had been purchased from N. H. Browning, the local dealer. Finally, I arrived home and found that Frank L. Smith had already completed the necessary wiring for my electrical fixtures on the Christmas tree. Another mechanic had also remedied a trouble which had caused me a little unhappiness--a frozen water pipe. Byron Parker had dispatched his men to my home immediately after I had telephoned to him. I did not attempt to do any more shopping that day planning to finish at night with my husband, who had telephoned in the meantime telling me to meet him at the railroad depot at 6 o'clock and he would help me out at night. I traveled to the railroad station and on my way noticed a shoe store that carried a shoe that was just the thing for children's wear in the winter. 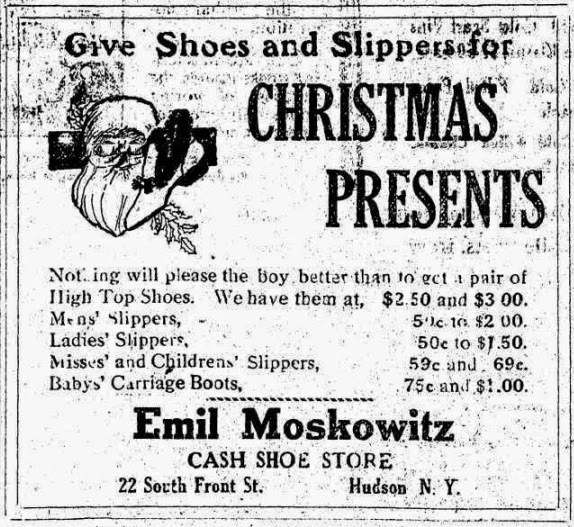 This was at Emil Moskowitz's store. After meeting my husband we walked up the main thoroughfare of the city and looked at the window displays in hopes of finding something that had been forgotten, at least one us thought that way. At Tresselt's paint stop we purchased some paint and other decorative material to make everything look bright about the Christmas tree. We went to the furniture store of A. D. Putnam's and there looked over the wonderful display of things that make a home happy. 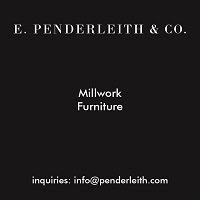 If there is one thing lacking in furniture in your home it can be found in this store. That night my husband looked over a combination kitchen cabinet very closely and then wrote something on a piece of paper. Ever since then I have begun to feel that Christmas cheer is near at hand. 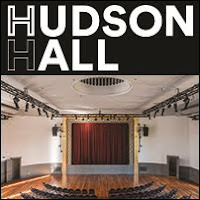 As the children were at a roller skating party at the Hudson Roller Rink where Julius F. Thompson's orchestra was furnishing the music, we were in no hurry to reach home. My husband told me of a way to hold the Christmas tree by placing it in a small box or pail filled with cement. 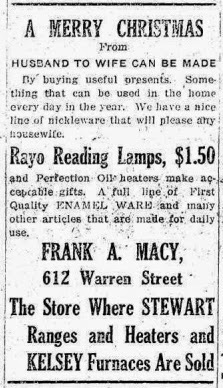 He had purchased this from C. W. Macy Co., the local lumber firm. At last we reached home, and seated at my piano-player, which was procured by C. B. Snyder, I remembered my childhood days as the strains of a Christmas anthem filled the room. It was surely going to be my happiest Christmas after all. 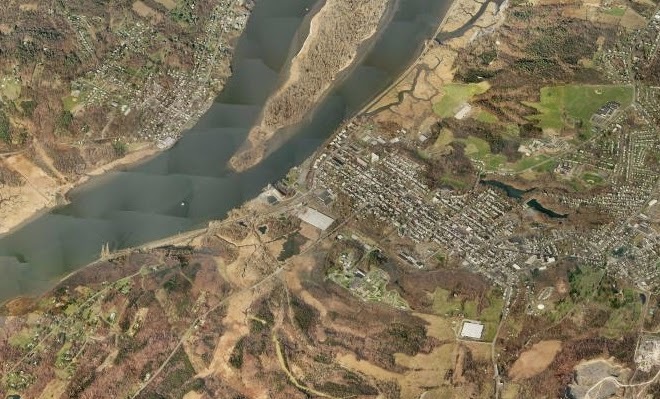 A couple of weeks ago, Gossips reported that grants had been awarded by the Regional Economic Development Councils to two projects in Hudson--one to develop North Bay as a recreation and natural area; the other to direct untreated storm water into North Bay. It was wondered at the time where the Conservation Advisory Council was when it was really needed. The Common Council passed the legislation creating it in June, but six months later there is still no CAC. 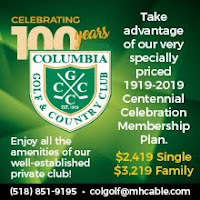 It turns out that, in this city of gifted and talented, educated and enterprising people trying to reconnect the city with the river and its maritime heritage, the Common Council, which will appoint the members of the CAC, is having a hard time finding people to serve. The CAC must consist of not less than five and not more than nine members, but not just anyone can be appointed. There are requirements, which are specified in Article 33 of the City Charter: "Such members shall have expertise in environmental sciences, planning, engineering, arboriculture, Geographic Information Systems, and associated skills by specified professional or educational credentials and relevant attainment." 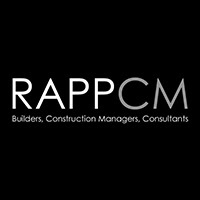 Click here to learn more about what's required and expected from CAC members. 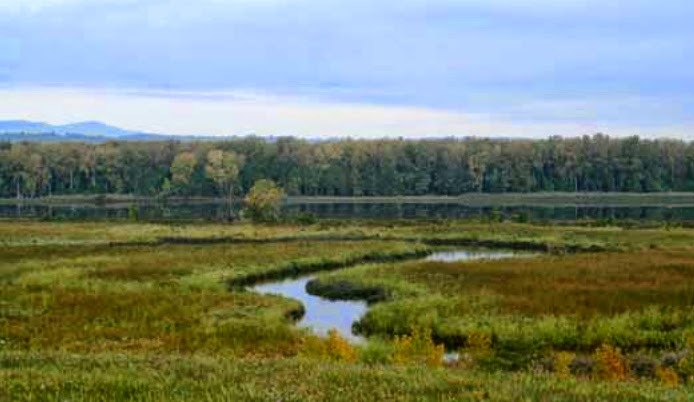 Hudson's location on the river and its two bays, which were the selling point for the city's seafaring founders, abused by folks with different priorities when Hudson ceased to be a maritime center, and today survive as significant wetlands, make it imperative that Hudson, as a municipality, be committed to conservation and ecological sustainability. Having a Conservation Advisory Council in place is critical to that. If you want to be part of the CAC and have the qualifications needed, make your interest known in an email to Alderman David Marston. Your service to the river and the ecosystems that surround it is sorely needed. 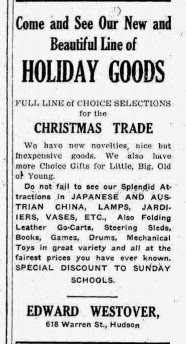 Here is the continuation of a new Hudsonian's account of the delights of Christmas shopping in our small city, which appeared in the Columbia Republican on December 26, 1914. 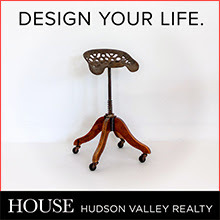 A suitable subtitle for this part suggested itself: Real Housewives of Old Hudson. 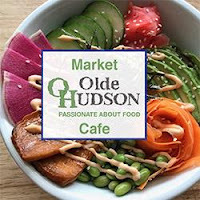 Having had the benefit of one day's experience in the shopping district of Hudson, of which I told you yesterday, I started out bright and early the next morning for the bargain district. Keeping my infallible guide the Morning Republican with me, I lost no time in reaching my starting point. I had arranged to meet several friends at various places and therefore I knew the first part of my shopping must be done quickly if I wished to be on hand at the appointed time. I made one brief stop before reaching Warren street at the store of M. W. Snyder on Columbia street. Hundreds of times I had passed this place never dreaming how cheaply oysters could be purchased as well as potatoes and other vegetables in quantities. My discovery led to a goodly purchase after which I continued my walk toward the stores. As I had but a few blocks to travel, I refused to ride in a new Ford car which a young lady friend was driving. She told me the car was given to her by her father as a Christmas present and that she had just brought it out of the William Petry Co., Inc., garage for the initial ride. It surely was a dandy gift. I recalled then of a gift which a young man of my acquaintance was to receive on Christmas morning. His was to be an automobile too, which had been purchased of the High Rock Motor Co. The Warren street garage also had furnished a like present for another acquaintance of my family. Such gifts are surely real Christmas presents but then I recalled how much the little things of life are appreciated and that it is the thoughts that go with the gift that make it a present worthy of just as much consideration as if its cost was one hundred times as much. With this feeling I went about my shopping with a rather old-fashioned Yuletide happiness. 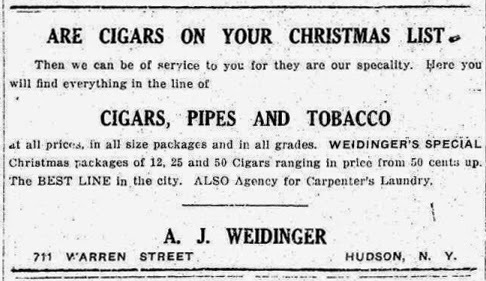 My shopping list contained a box of cigars for my husband and I purchased these at A. J. Weidinger's, who carries an exceptionally fine stock for the holidays. The show window of Frank Perry's store attracted my attention. 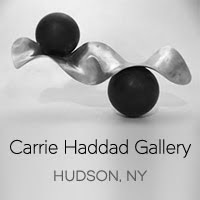 I learned that this was a gift shop as well as Hudson's leading piano and musical instrument headquarters. In the gift shop department there are so many wonderful gifts that I spent more time there than I had expected. 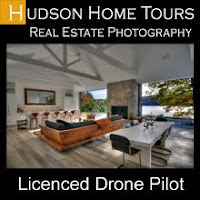 I was well satisfied however as I purchased a few articles which I had not believed in Hudson. 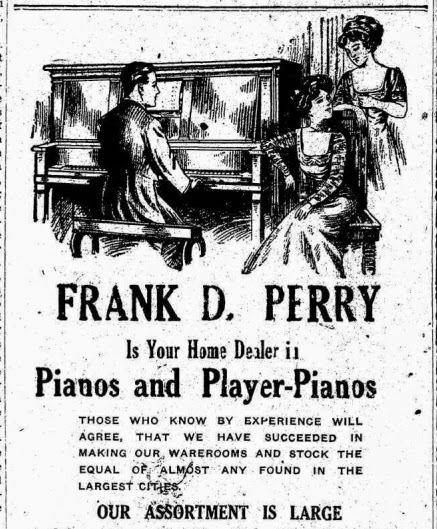 The piano business seemed exceptionally brisk. Very near the Perry store I noticed a place where young folks and baby's garments are extensively carried as well as a full line of ladies furnishings. 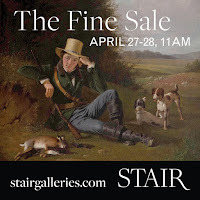 This store, conducted by Samuel Silver, appealed to me and once more lessened my bank account. My two friends met me as I was leaving this store, having thought I was lost. They had so many things to tell me that they had walked two blocks upstreet to meet me. 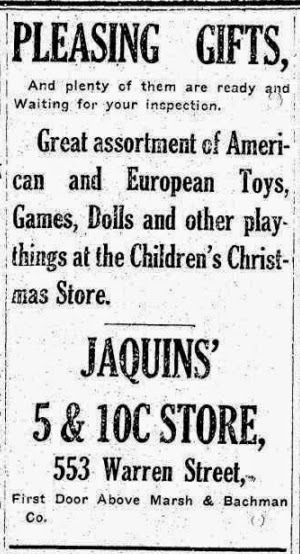 One had found an ideal place to buy inexpensive gifts for children at Jaquins' five and ten cent store, which had just been completely restocked for the holidays. 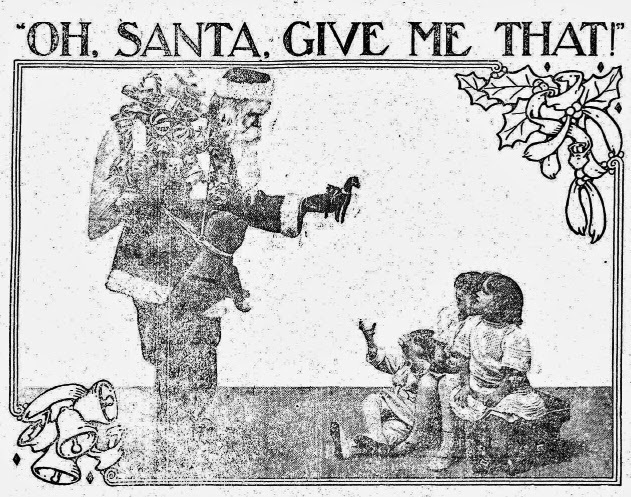 Our attention was attracted then to a "real" Santa Claus in the window of R. H. Grossman, the enterprising shoe merchant. At the same time I noticed the many shoppers who were purchasing gifts in foot wear in that store. 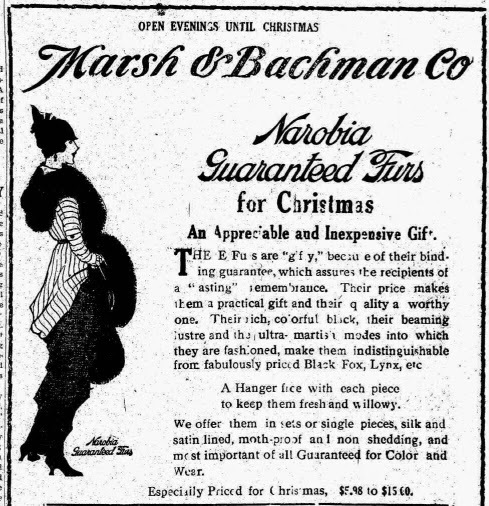 Our first visit together was made at the Marsh & Bachman Co. store. I had often been in this store but never realized until that time that it was a great department store in a small city. Here was a store just like those in the greater cities. The three floors were crowded with customers while the obliging clerks hustled back and forth. The line of goods carried here is too extensive to go into detail but there is everything from a wedding dress to toys. The gifts suit all classes of people and we shopped on every floor. It is a safe wager the errands boys will not smile when we enter that store again. Just above the Bachman store on Warren street is the J. T. Guinan Co. department store. Here the shoppers were on hand in great numbers purchasing thousands of pretty gifts that can only be found in a store of this kind. 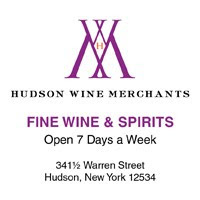 I was told that this store is somewhat new in Hudson, but one which enjoys a high reputation hereabouts. Once more "our busy trio" made the clerks wrap up a number of purchases. Further down the street we found a store which caters to the ladies. 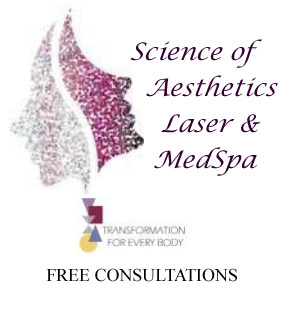 It is conducted by K. V. Clark Co., and is simply stocked to the limit with everything to make a feminine heart happy. From seal-skin coats to handkerchiefs there is a wonderful assortment. I believe I will hint to my husband that there is a store of this kind. The others wished to go downtown but I thought differently as I wanted to go to Falk's, a store which always suited my wants. I had not been there lately so was agreeably surprised to find the holiday stock that is carried there. 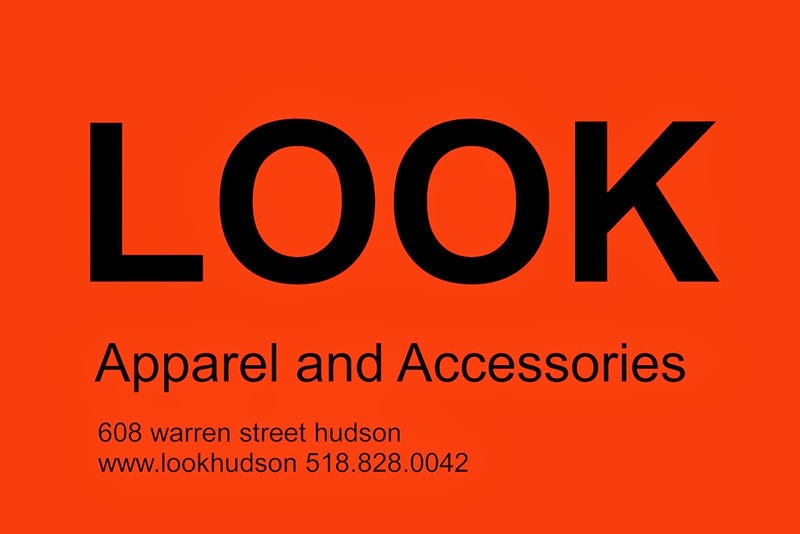 I suppose everyone in Hudson knows what gifts can be purchased here, whether it is for man, woman or child. My friends will go at my bidding hereafter as they found articles which they had hunted from Albany to New York for. While in this store I learned from an acquaintance that "toy land" was to be found at Westover's. She had [made] many a number of purchases there and told me of the many things in crockery I could also find in this store. 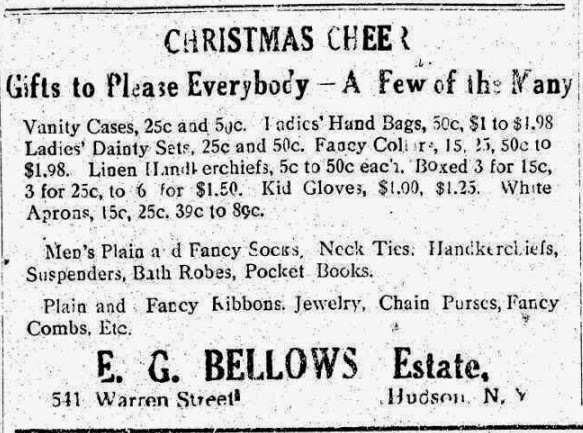 We then went to the store conducted by the Bellows estate. I found one of my friends wished to look over the extensive line of furs carried. Every article that can be found in a first class dry goods house is procurable at Bellow's at a most reasonable price. We had been looking for linens and so visited the Guernsey & Terry Co. store. We looked no further after seeing the stock on hand which was the finest I had ever seen. 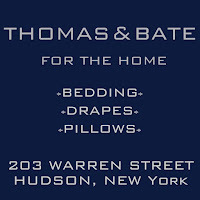 Besides linens, the store was most carefully stocked with a high grade line of carpets, rugs, mattings, etc. 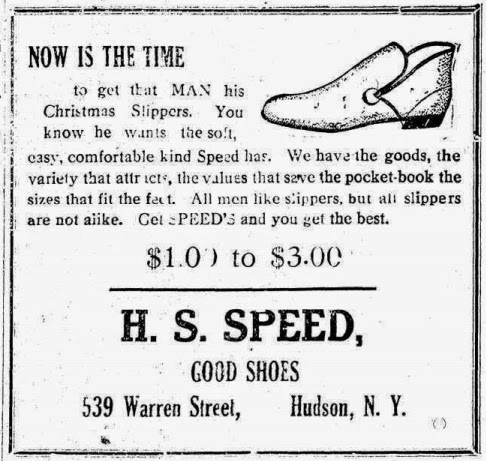 It was beginning to snow by that time and with my friends I went to the shoe store of H. S. Speed to purchase a pair of rubbers. I found that they had a fine lot of slippers on display and that a number were buying these at the time. They surely make a most suitable present for young or old. 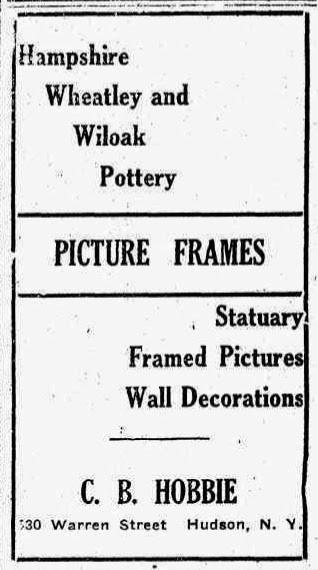 We had two more places in mind to visit that morning--the dry goods store of P. McDonald & Son and the New York Cloak and Suit Co. house, both of which are on Warren street. The former store has an extensive dry goods trade for the reason that it carries a complete line. Everything that a large house carries is in stock there. The cloak and suit house appealed to us also. There a husband cannot help but find a gift which his wife will more than appreciate. 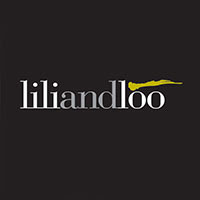 They have everything in ladies', misses' and children's wear. It was near lunch time and we parted with our bundles with an agreement to meet in the afternoon and look over the millinery shops in the afternoon. As my cash was rapidly disappearing I visited the Farmers' National Bank and drew up a check for my further needs. I was therefore able to check out some of my deposit in a commercial way and the larger bills by checks on this bank. As the workmen had just completed placing a steel ceiling in my husband's office, I dropped in to see him all in smiles. The improvement seemed to even affect the clerks who were humming away as they worked. He told me the ceiling was really "a work of art," and spoke highly of E. H. Davis who had more than fulfilled his contract. After lunch I met my friends and we started to look over the millinery line. 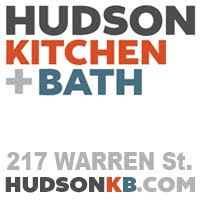 I have always found that Hudson affords better places to purchase in this line than many much larger towns. The milliners in Hudson are far more up to date and exclusive than one would imagine. The window display of Paris Millinery called for our attention first. Here we met another acquaintance who was ahead of us in looking over hats. Being young and pretty she realized the value of a hat in the winter of the latest style was of just as much importance as one on Easter Sunday. Perhaps the following assertion may be questioned but still it is a fact. There were five of us in the millinery hunt and each purchased in a different place. The reason for this I cannot say. In each there are hundreds of the latest models and trimmed with rare taste. At Miss Martin's and Miss Hickey's my two companions purchased while our new shopping friends bought at the Paris and Menick's. I waited until we reached Miss McNamara's and there I found a stunning one that just suited my taste. 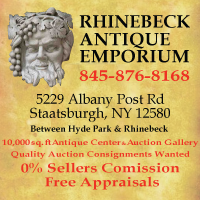 We decided that Hobbie's was the place to purchase pictures and pieces of statuary, most appreciable gifts for Christmas, and found a rare line to choose from. There were just four good customers in our party for Mr. Hobbie. The reason why there was not more was that there were only three others besides myself. We stopped at the store of Grover Niebergall where we looked over a big stock of sweet-voiced canaries, gold fish, etc. My mother had often wished for a canary and I found a gift here that will surely please her. It was becoming late, so we decided to put off the rest of the shopping until the following day. 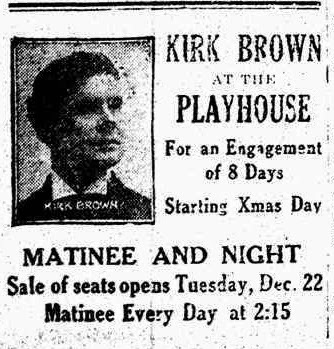 Before we parted, however, we agreed to spend Christmas afternoon at The Playhouse and witness the opening production of Kirk Brown's company. We parted and I was soon home not the least bit tired from a long day's shopping and just as eager as ever to continue. The next day I succeeded in purchasing all my needs as well as those for a few others which I will tell you about tomorrow. Yesterday, Gossips reported on the disappearance of Theresa Hyland from the staff roster on the Register-Star website, but Hyland isn't the only person to depart the paper recently. Three others left in the last month or so for new jobs elsewhere. 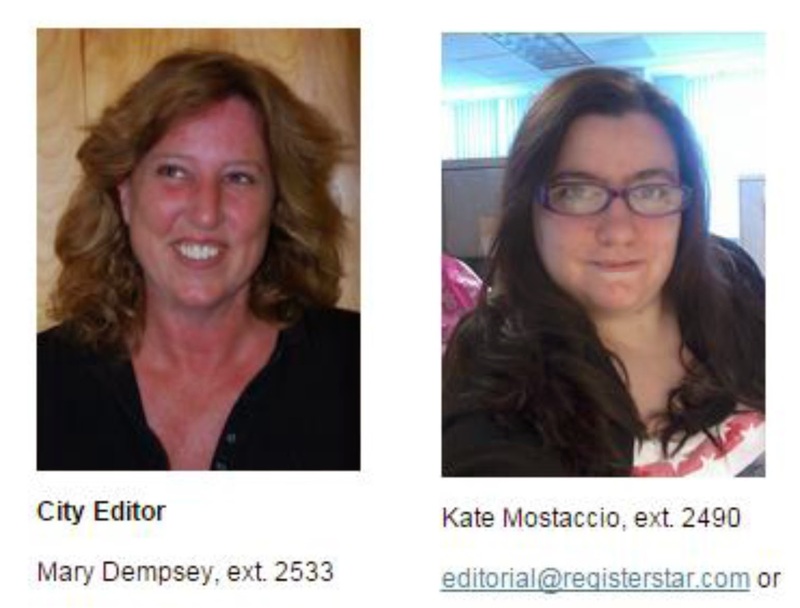 In November, Mary Dempsey, the city editor, left the paper; in early December, David McDonald ended his brief stint as social media and web editor; and last week, Kate Mostaccio, who has been part of the news staff for more than six years, also moved on. Strangely, although all trace of Hyland has disappeared from the website, Dempsey's and Mostaccio's pictures remain. Maybe it's just a matter of not keeping the website up to date. Based solely on the list of contacts on the website, it would appear that John Mason and Arthur Cusano are the only members of the news staff left, but bylines indicate otherwise. 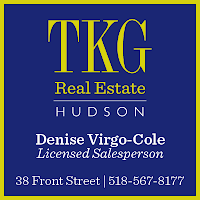 Siobhan Barton and Katie Kocijanski regularly report the news in Hudson and places nearby, but their pictures have yet to appear on the website. 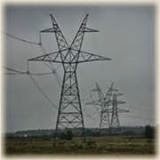 An editorial, which calls on the Public Service Commission to be "receptive to as much new data as possible" at its June conference and references the Hudson Valley Smart Energy Coalition's argument that "enough future power production exists in the pipeline that more robust transmission pathways are not needed," appears in today's Poughkeepsie Journal: "N.Y. must correct course on energy policy." 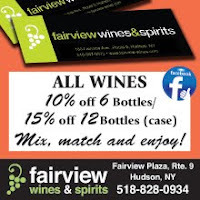 While I have resided in Hudson nearly eighteen months, coming here from Pennsylvania, I have never done much Christmas shopping here. 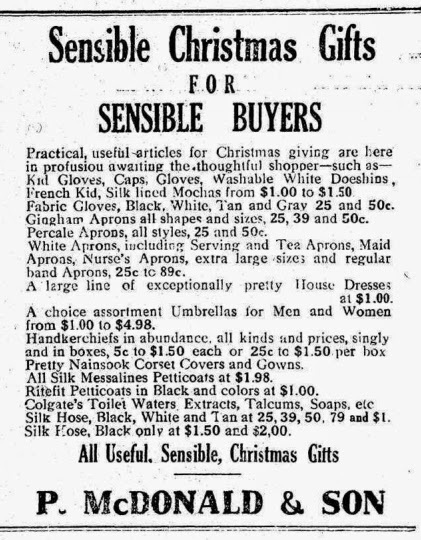 I had always been accustomed to buying my Christmas purchases in Philadelphia among the great department stores. 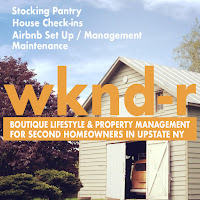 Having this idea in mind I traveled both to New York and Albany last December, believing that shopping of the right kind could only be done in big stores in big cities. 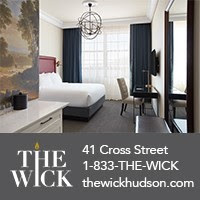 But the tiresomeness of traveling, the long waiting for trains and the many other inconveniences of shopping out of town, not mentioning the expense, made me inspect the Hudson stores this time for holiday buying and I will never again have the impression that shopping cannot be done right in a small city. I have found articles here in this pretty little city that I have searched for day in and day out in the great department stores. 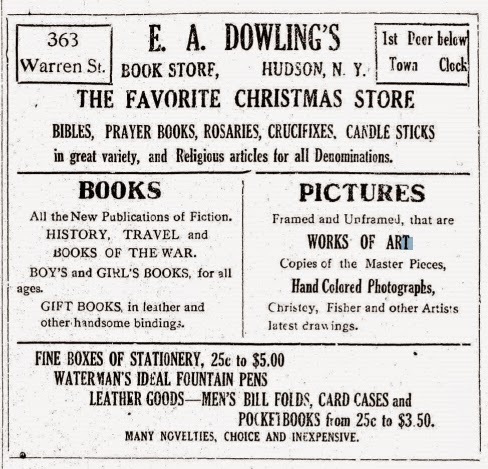 There is nothing that the Christmas shopper could imagine that is not to be found in some Hudson merchant's store. And then you are treated so cordially by the polite and pretty shop girls. 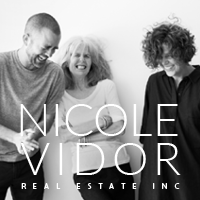 Nothing is too much bother for them or the store proprietors as well. Not being a full fledged Hudsonian in the full sense of the word I took my Morning Republican with me the other day and guided by the attractive advertising, "did the rounds," and I can assure everyone that I am perfectly satisfied now that my choice of presents this year will hit the mark everywhere. I first visited some meat markets including those conducted by A. F. Funk, Charles Scheu, J. Rettstadt, Koslow & Liepshutz, and J. Liepshutz, in order to price their real Christmas birds--the turkeys. 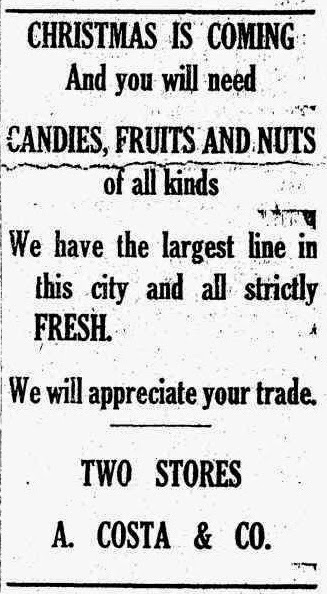 I was surprised to note the cleanliness of the markets and the prices quoted for the delivery of a turkey, dressed and plucked. Every market was well stocked with choice meats of various kinds and I took advantage of the prices. Having procured the best part of the dinner of dinners I looked about for the "fixings," for surely I could hardly leave a turkey unaccompanied on the table, on such a day. 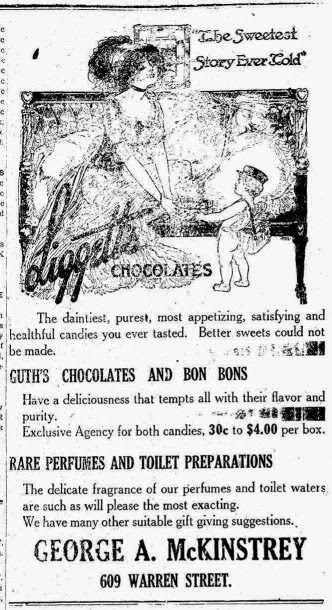 I looked up the groceries and visited C. S. Rogers, The Great Atlantic and Pacific Tea Co.'s store, Koster & Englke, C. J. Bedford and Frank Horth. The enormous line of groceries carried by these stores almost made me believe I was imagining a whole lot. From fresh vegetables to delicate relishes I found in these places, including every kind of staple goods. 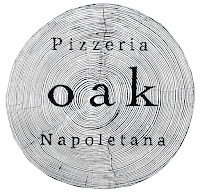 The prices were quite reasonable and my appetite wants perfectly appeased. There were some things I needed on the table as well as little things that Santa Claus might not be able to crowd into the little stockings, so I stopped for some fruit at Costa & Co. and at Samuel Sutty. These fruit stores were fairly overflowing with everything ripe and juicy. There were many other things, including pure olive oil, an article which I had hunted high and low for, expecting to find it at an importer's place of business. Then my thoughts turned to the little folks. What kind of a Christmas would it be if they did not have their fill of candies and sweet things for once in a year. 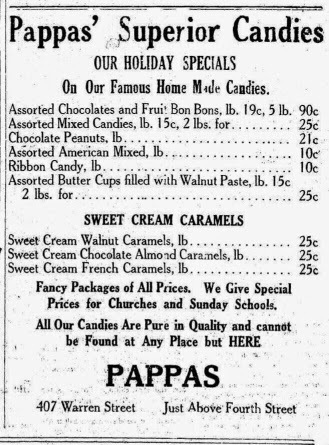 I stopped at the Eagle Confectionery Shop and the Pappas Candy Parlor. Their candies made by expert candy makers in their own kitchens suited my taste and I went no further in this line. 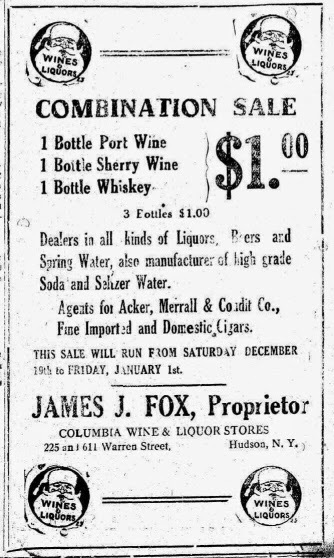 As I glanced down at my Republican I saw the advertisements of the Columbia Wine and Liquor Co, who have two Warren street stores, and the Diamond Bottling Company. Then I remember that the old folks were coming and some "Christmas cheer" was a necessity. I visited the places and found they had prepared clever combination sales for one dollar and I immediately invested. 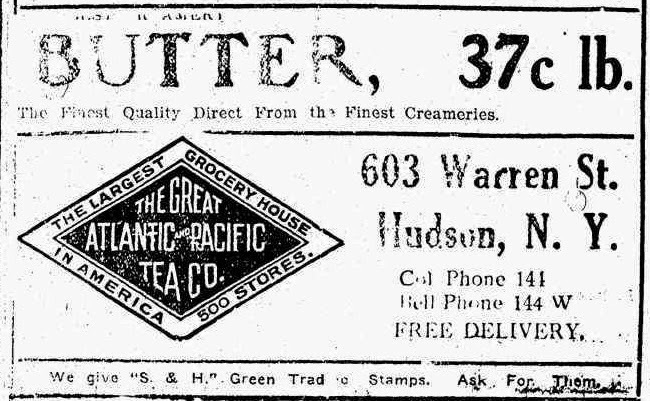 A bit of ice cream would top off my dinner in fine shape, so I glanced at the ads in the paper once more and found that Dayton & Lamont and C. C. Griswold had stores on Warren street and were taking orders for their celebrated cream in the brick form or by the quart. Once more I was a customer. As it was then time for luncheon and there was not real need for my traveling to the outskirts of the city for a bite, as I wanted to continue my enjoyable shopping trip, I dined at the City Hall Grill. Everything was so neatly and quickly served with the politeness of a Parisian cafe I began to wonder if a good many people did not have their Christmas dinner in this cosy grill and the waiter obliged by affirming my belief. Greatly refreshed, I started out anew. The taste of a delightful portion of fish and a few oysters which I had had at lunch gave me a new thought. 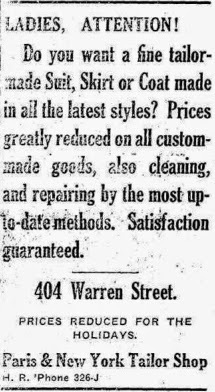 My newspaper did not fail me and I quickly found the well stocked markets so well known as Ford's and Newcomb's. I placed my orders for Christmas and departed having found just the foods that I wished at the right prices. 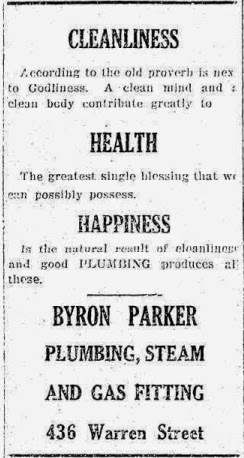 There were a few articles in the stationery I needed that day and the advertisements of Frank Maloney, Eugene Dowling, Wm. Ziesnitz and Jerry Downing attracted my eye. Instead of buying my few needs I purchased a number of articles which will make delightful gifts. They were pictures, leather goods, writing paper, etc., just the things that make appreciable but still inexpensive gifts. I was on my way back to the grocery stores to pick out my Christmas tree when I met a young lady in my acquaintance. She had just cashed a Christmas Club check on the First National Bank and told me it was the best thing she had ever done when she made weekly deposits there for holiday expenses. She accompanied me to the Albany Southern Railway office and to the store of A. E. Johnson, where I purchased the cutest electrical fixtures for my Christmas tree I had ever been able to find. My friend wished to look over bicycles, a gift for her brother. We journeyed to the store of G. Edward Purlver. He had the very kind she wanted and a sale was made in a few minutes. At Wm. 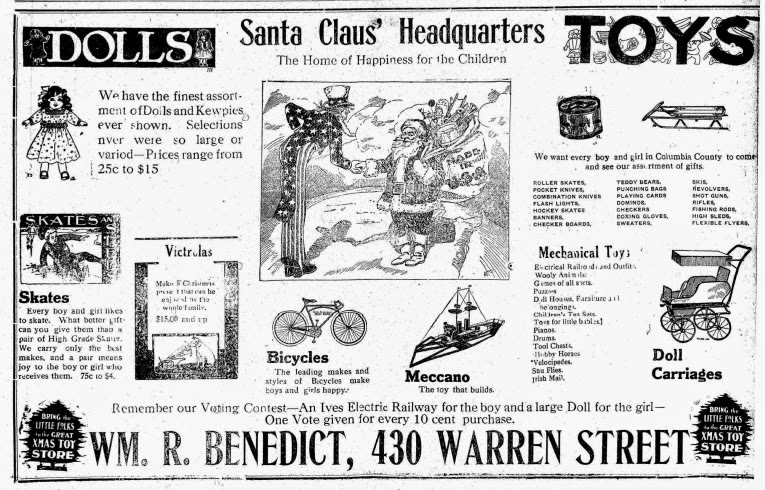 R. Benedict's my curiosity was aroused by the thousands of electrical toys and other things that make the little folks happy. I made several purchases and then helped a deserving youngster along by giving him my votes in the Christmas contest there. Having forgotten to look over penknives, skates, etc., the things that tickle the heart of the future men, I decided to look over the stock at some hardware stores. With my friend I visited Kingman's and Rogerson's & Co.'s. I made several purchases and then watched the customers pick out such useful gifts as food choppers, carving sets, etc. Leaving the buzz of the hardware shoppers behind, my friend and I started to look over those neat, useful and non-expensive gifts which are found in the pharmacies. Before we reached the store of McKinstry & Son, we met a neighbor of mine, who also was making Santa Claus look cheap. She told me of a gift her husband had purchased for her--a full set of china--from the Osborne crockery store. It struck me at that moment as one of the best Christmas gifts procurable. 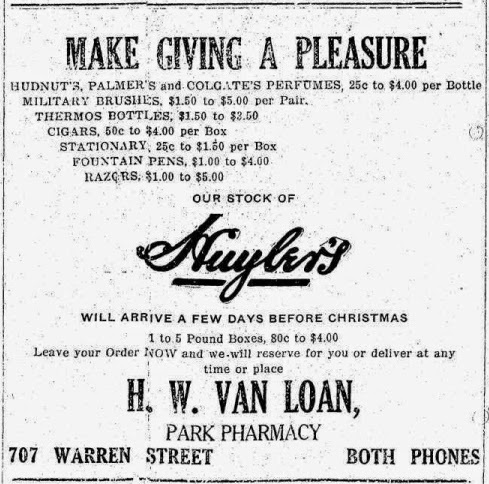 With two companions now I felt right at home in the hurrying crowd and soon we reached the McKinstry drug store, the pharmacy of Leavitt & Smith, Van Loan's on the Warren street side of the park, the Economy drug store, T. E. Burkes's and then to the end of the bsy street to Wardle's. In every one of these stores we found a welcome gift. Sometimes it would be a comb and a brush; sometimes a shaving set, a bottle of perfume or toilet water. In fact there were so many useful gifts I cannot remember all the things "our busy trio" purchased. I noted that nearly one out of every three in the drug stores placed an order for the Christmas chocolates and bon bons of the standard kinds put up in special holiday packages. My young friend seemed a bit nervous and I questioned her. She said she had a gentleman friend whom she wished to remember on Christmas eve. I recalled then the same feeling she was experiencing but mine was in happy days gone by. I knew the young man well, upright and enterprising, and he was to be rewarded. My companion guided us to the jewelry district--it is all in one section--the Clow store, the Joseph store and the Maratskey store. With the taste of an expert she went over the cuff links, rings, watches, stick pins, etc., and with excellent judgment as to both price and article, she made the purchase that meant more to her than all the others. She sealed my lips when we entered the stores, as I am not at liberty yet to disclose what one lucky young man will receive. The grayness of the short December days was slowing drawing itself about the shopping district, so after bidding "good-day" to my young friend, my neighbor and I hailed a Hudson City taxicab and were whisked back to our homes full of appreciation for the Hudson merchants and their stores, and agreeing that nothing but a blizzard would keep us at home the following day, the experiences of which I will tell you on the morrow. 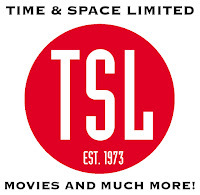 "It's Been a Long Time Coming . 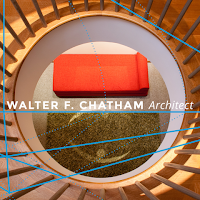 . ."
What's Possible for the Dunn Building? You Can't Always Get What You Want . . . In the Category of "It Was Ever Thus"